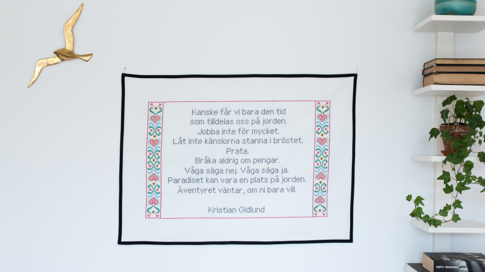 Embroidery kit Aida wall hanging "Äventyret väntar / Moraeus "
Kristian Gidlund - musician, journalist and inspirer. He was the drummer in Sugarplum Fairy who became a journalist and nationally famous with his blog "In the body mine" in which he wrote about his life with cancer. 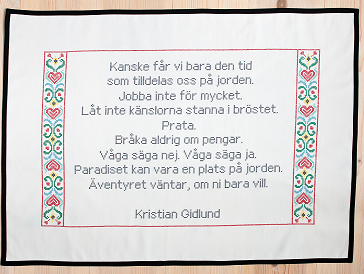 Kristian passed away September 17, 2013, but his writing lives on and inspires. This is our tribute to him and his magical lyrics. Sit down and relax for a while, take out your embroidery and start cross stitching his lyrics that will give you insights like nobody else could give you.